The wall mounted clamp on ultrasonic flowmeter belongs to range of fixed installing type flowmeters, as a good selling model,it has been carefully designed,so it provides abundant capabilities for accurate non invasive liquid flow measurement. The wall mounted flowmeter can support clamp on transducers,insertion hot-tap transducers and inline transducers to different requirement.The flowmeter can be powered by wide AC and DC power. 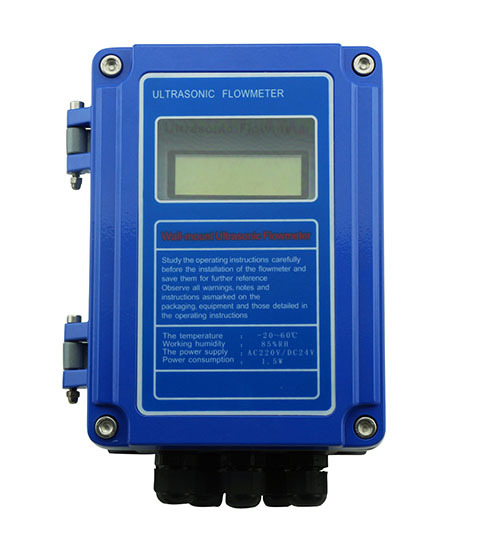 With non-intrusive flow transducers, the clamp on ultrasonic flowmeter provides many good features:no need to cut pipe,no direct touch to liquid, no pressure drop, no moving parts, no risk of contamination, no risk of corrosion,and etc. The wall mounted clamp on flowmeter also supports versatile signal outputs/inputs and communication protocol,which includes RS485,4-20mA(0-20mA), OCT pulse, relay signal, frequency, batch control, Modbus,M-bus,Hart,etc. With batch control, the clamp on flowmeters can be used for irrigation. Meanwhile, we can also supply built-in data logger to the wall mounted flowmeter and the data logger can store large capacity data from 1G to 8G. (default is 4G). 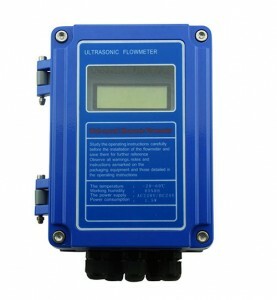 Over 20 items data can be programmed in flowmeter to record in the data logger. The data is stored at TXT file in SD card and easily exported to PC by USB port. And TXT data can be easily processed by Excel or Users’ program. With strong experience, we can supply large capacity serial port data logger for other application, the data logger can be RS232 data logger, RS485 data logger,USB data logger, TTL data logger,etc. (1).Guaranteed lowest price on the market. (2).High accuracy. Normally, ±1% When on-site calibration available, ±0.5%. (3).Wide flow range 0.03 to 105ft/s. (4).Wide pipe size range (from 1″ to 240″). PI type transducer can be made to measure the min inner diameter of 2mm. (5).Noninvasive. No pipe disturbance. No moving parts, no pressure drop. (6).Easy and economical installation. No cutting pipe, non drilling hole. Velocity ±0.03 – ±105 ft/s (±0.01 – 32 m/s), bi-directional. Display LCD with backlight. 2×20 letters. Display instantaneous flow rate, accumulated flow rate (positive, negative and net rates), velocity, time, analog inputs, etc. Signal Outputs 1).Current output: 4-20mA or 0-20mA. Impedance 600ohm(float blank), Accuracy 0.1%. Module optional. 2).OCT output: frequency signal for instantaneous flow rate (0-9,999Hz selectable), Module optional. 3.Relay pulse output: pulse signal for accumulated flow rate (positive, negative and net rates);double channel OCT output (pules width of one channel is 6-1000mS,programmable, the fault value is 200ms. 2)2 channel 3-wire PT100 input can measure heater. 4) The instrument working status of the last 64 days. 6)One bi-directional SATA port can connect a few external equipment,such as 4-20mA, data logger, printer,etc. 7)Working parameters can be solidified to flash memory, automatically call-out the stored parameters. Transducer Cable Shielded transducer cable. Standard length 15ft (5m). Can be extended to 1640ft (500m). Contact the manufacturer for longer cable requirement. Pipe Material All metals, most plastics, fiber glass, etc. Allow pipe liner. Pipe Straight Section Length Better longer than 15D, where D is pipe diameter. If a pump is near, the straight pipe section following the pumps should be > 30D. The factory default configuration is wall mounted unit+medium transducers+2*5m cable.